It’s important to always remember that the insurance policy you have is a legal contract and that it’s written by the Insurer. Inevitably, its written to most favour them and one of the aspects that is least liked is “hidden away” within the policy wording and called the Average Clause. Along with a number of friends and members of Saif, I am off to do the Three Peaks Challenge again for an incredibly worthy cause. As many of you know, I have had the incredible pleasure of working alongside Saif and the funeral profession for some 24 years and have met some incredible people and forged some amazing friendships over that time. Its also given me the opportunity of being able to participate in some amazing challenges to raise some much needed money for various charitable causes supported by Saif. The link for donating is below and on behalf of myself and the others doing this, we are most grateful for anything any one can spare as rest assured all the money raised will go to this incredible hospital and the work they do. The ambitious challenge to raise £100,000 for Great Ormond Street Hospital (GOSH) was a pledge made by Jamie West to thank the hospital and staff that saved his daughters life. Eva Jem West was born on the 21st October 2017, but sadly the joy of welcoming her back to the family home was short lived as she was re-admitted back to hospital at 9 days old. After a worrisome few weeks Eva was transferred to GOSH for further investigation. Within 24 hours they were able to diagnose Eva’s extremely rare h-type tracheoesophageal fistula (TOF) which is an abnormal connection between the airway and the food pipe. This meant as Eva swallowed milk small amounts would enter her lungs and without surgical repair she would not survive. This life-threatening condition affects 1 in 100,000 children – which is the target fundraising amount #teameva have chosen. TOF’s often lead to severe and fatal pulmonary complications and just hours after being diagnosed things suddenly took a turn for the worse as Eva’s lungs could no longer cope. Eva was admitted to intensive care – and our 3-month rollercoaster began. To watch your child fight for their life is every bit as horrifying as you might dare to let yourself imagine, but through even the darkest moments we remained grateful for the world class care Eva received. Eva was stable enough to have her operation on the 19th of December and she was finally able to come home on Valentine’s day. Although Eva is still fed via a tube and will require special care for some time to come, we are forever grateful for the treatment she continues to receive and the wonderful opportunity of life that is ahead of her. So, to celebrate our incredible Eva and to extend our gratitude and thanks so that GOSH can continue to change the lives of other families with seriously ill children. We welcome you to support #teameva in whichever way you can. 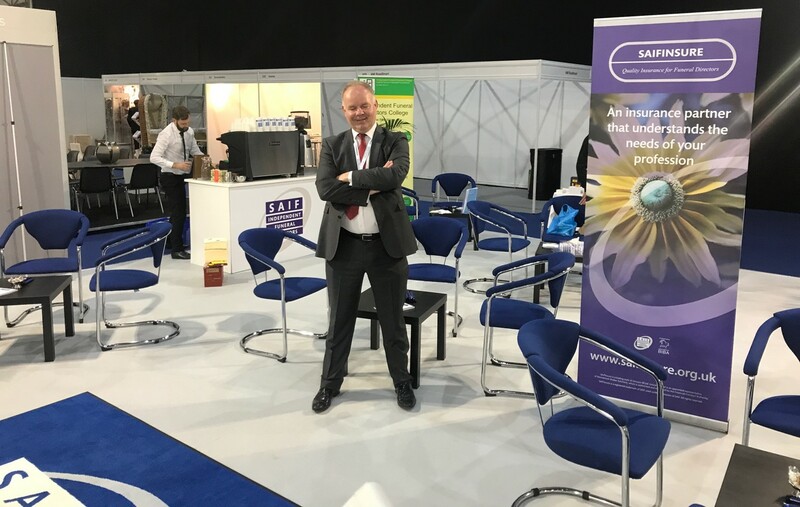 SAIFInsure is delighted to be joining SAIF at the National Funeral Exhibition 2017. The National Funeral Exhibition (NFE) is a respected global platform for the funeral profession and the largest trade show for the sector in the United Kingdom; showcasing the latest, innovative products, inspiring thought leadership and business networking opportunities to 3,000 funeral sector professionals.